“Terrorism.” The word threw Sophie Harkat back into her chair, like a bomb emitting a shockwave through the earpiece of the phone. The impact forced out a scream of disbelief, and her concerned colleagues ran to her. It was a Tuesday afternoon and Sophie was at her shared office in the membership fundraising department at the National Gallery of Canada in Ottawa. She’d just received a call from her husband’s immigration lawyer: He had been arrested. For suspected terrorism. It was three weeks shy of their second wedding anniversary on Dec. 10, 2002, International Human Rights Day, when Mohamed Harkat was arrested under a security certificate—a controversial tool in Canadian immigration law, implemented in 1978, that allows the government to indefinitely detain non-citizens suspected of terrorism. A three-walled prison the government calls it—because the option to go back to your home country is always open, even if that means facing torture and even death. These individuals aren’t charged with a crime and don’t have access to any of the evidence against them. Since 1991, 27 men have been issued a security certificate. Currently, there are three men who have outstanding security certificates. Mohamed Harkat, 47, an Algerian-native who has lived in Canada since 1995 and goes by Moe—a name well suited for the community handyman—has been living in Ottawa under this security certificate for over 13 years. Sophie has been fighting for his life ever since. Moe was granted refugee status in 1997 after successfully claiming government persecution based on his political affiliations if he returned to Algeria, where his family still lives and he’ll likely never be able to see again. CSIS alleged that Moe was an al-Qaeda sleeper agent who attended a terrorist training camp in Afghanistan and ran a guesthouse for terrorists in Pakistan, among other circumstantial evidence the government says is too dangerous to reveal. Sophie was sitting in a cold waiting room at the Ottawa-Carleton Detention Centre when she saw him in his jumpsuit; metal cuffs shackled his wrists, chains connected to his waist, then to his ankles. Her head was pounding from crying and worry kept her from sleep. What the hell is going on here? —the first words she said to Moe. But as he looked back at her behind the inch-thick glass that separated them, she already knew he’d been wronged. His lawyers later echoed her thoughts: He was a nice guy who got screwed by the system. She knew she had to take it on from there. Sophie, 41, who grew up in the small town of Haileybury, ON, recalls the beginning of the family’s ordeal, with stark clarity, as we sit together at her orderly dining table while Moe works away in the garage. Sophie met Moe at a gas station she frequented on her way to and from work for a bottle of Diet Coke. One night, after a disastrous blind date, she walked in to the store in a bitter mood and Moe was behind the counter being as friendly as usual and she couldn’t help but melt under his kind gaze and genuine smile. A few months later, they eloped. Almost two years later, they were living in a small Ottawa apartment when Moe was arrested. The couple was making plans to get a bigger place and start a family. All of that was brought to a screeching halt. Sophie has a stubborn propensity to focus on the positive—an optimism her mother, Pierrette Brunette, says she’s possessed since she was a child. This attitude pushed Sophie into immediate action after Moe’s arrest. She set up a press conference and called newsrooms herself, which earned this response: “Wait, you’re the Mrs. Harkat from Ottawa?” Like a horse out of the gate, she was ready to run with it. Much to her high school teachers’ surprise, the always-funny improv champion didn’t pursue a career in theatre or stand-up comedy. Instead, the bilingual French Canadian studied public relations at college—a background she had no idea would be so useful. In a way, she took on the biggest PR job—defending her husband, lobbying politicians, campaigning to the public. Moe is soft spoken and reserved—a contrast to his wife whose always-red cheeks signal her fiery nature. So it only came naturally—her husband shied away from the public eye and Sophie has become the face of the fight against Moe’s deportation and an advocate for the abolishment of secret trials. It was Moe’s face that donned the posters with the words “Stop secret trials,” but it was Sophie who spoke at every event. Working on Moe’s case is her full-time job, on top of her part-time job working as a school crossing guard. It was a complete 360 for Sophie. Her career. Health. Family. Life. Thirteen years of what she calls psychological torture. Yet she maintains the same unwavering drive and tenacity she had from the beginning. After three and a half years in jail, Moe was released on strict bail conditions, which included constant supervision by Sophie or her mom, an ankle monitor and constant surveillance. Their emails and phone calls were monitored and recorded—from arguments over who should win America’s Got Talent to discussions about Moe’s case. Sophie often responded with “I’ll talk to you in person,” which CBSA thought was suspicious and later tallied to almost 400 times in court. On preapproved outings, conspicuous agents followed them closely, taking notes, bulletproof vests and large bolded letters on display. Literally breathing down their necks. Mohammad Mahjoub, another of the men with an outstanding security certificate in Toronto, decided to go back to jail when the repressive conditions proved too much for his family—his marriage deteriorated and his two teenagers lived with depression. To spare his family, Moe offered on several occasions to return to jail. To relieve the almost unbearable hold the government had on their lives. For Sophie, that was out of the question. That would be giving in to a process designed to humiliate the couple to the point of resignation. They’d worked so hard to get him out. And no way she’d return to a life of missing him. His smell—the mixture of diesel and dough that coated his skin after working at the gas station or delivering pizzas. His cold feet brushing hers as he’d get into bed. The sound of his laugh—cute and giggly, she says. I never got to hear that laugh. Despite her unwavering loyalty, there were moments when Sophie hated Moe. When they both hated each other for making that decision. Even after Moe’s conditions relaxed, they couldn’t just push play on their lives again. He spent three and a half years in jail and even once Moe was released under house arrest, they didn’t want to raise kids under those conditions—not being allowed to go outside. And even when it was approved, CBSA agents in bulletproof vests parked outside would be watching their every move. That wasn’t a life they wanted for their kids. By the time they were ready, Sophie had several health issues with her diabetes. Three years ago, she suffered a miscarriage and hasn’t been able to get pregnant since. My eggs are getting old, she joked. And the chances they’ll be able to adopt? Sophie’s doubtful considering the accusations. Once you’re labelled a terrorist, it follows you for life. “I blame the certificate for costing us a family. I absolutely blame the certificate for that,” she says. Yet, it’s still something that haunts her every day. The unending fear Moe could be taken from her at any moment. For Sophie’s mother, Pierrette Brunette, she still hears her daughter’s voice in her sleep on occasion—hysterical, and yelling a panicked language she can’t understand. “What a loss of time. What a loss of money. A lot. What a loss of energy,” she says, revealing a gap between her front teeth and her glasses resting on the tip of her nose, as we sit in a crowded café. Brunette’s features and mannerisms were so similar to her daughter’s—down to her laugh and sense of humour. Sophie told me about an encounter with a stranger who came up to her and told her she reminded her of someone she knew, which eventually turned out to be her mother. “Has your optimism ever wavered throughout the years?” I ask her. And without hesitation, she responds: “No.” But she says it’s definitely punched her in the gut. They lost their Supreme Court case on the constitutionality of the security-certificate law in 2014—their last legal challenge against Moe’s security certificate. Send me with a casket, he said. That’s how certain Moe is about his death if he’s sent back to Algeria. 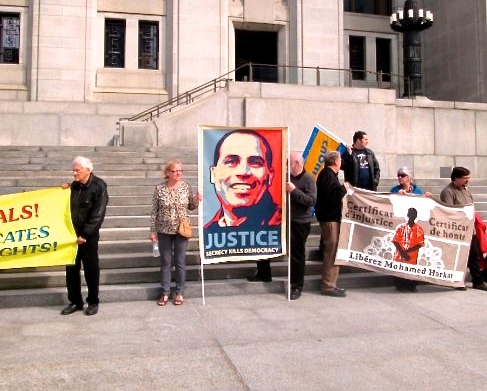 Hilary Homes, the acting manager of the campaigns program at Amnesty International Canada, says Moe will likely face “incommunicado detention,” often used on terror suspects by countries like Algeria in which individuals are denied access to family members, legal counsel and independent doctors, and are also at higher risk of facing torture. For instance, Algerian-born Mourad Ikhlef was deported to his home country under a security certificate in 2003, where he was imprisoned and denied basic legal rights, such as being questioned under duress. Now the reality of deportation is closer than ever, and Sophie can no longer avoid the subject. She thought they’d see justice before it reached this point. Now that their legal remedies have run out, their only chance is to show that Moe faces certain torture and death if he’s deported, and that the risk outweighs the danger he poses to Canadians. Which can’t be too large considering his bail conditions have lightened to the point where he can travel anywhere within the Ottawa boundary. Sophie is still looking for open doors, as she put it. She’s still hopeful the new Liberal government will repeal Moe’s security certificate. Alexandre Trudeau, Prime Minister Trudeau’s brother, has been a big advocate for the abolishment of security certificates and even made a documentary about the law in 2006. Now, at 41 years old, Sophie has spent a third of her life in this seemingly unending battle. Psychological torture—that’s what Sophie says she’s been through for the past 13 years. Putting her life out on a platter. She gave her husband a voice when he had none. And she has gained the support of several people who have given donations and posted bail for Moe; long-time supporters with equal tenacity and fierce advocacy for Moe, who have now become part of their family. These supporters have been instrumental in the fight towards abolishing the security-certificate law. One Saturday night, about 60 of these supporters gather in a music-filled house that vibrates the hardwood floor—a special event serving as a thank you to supporters for their continued advocacy. It holds the ambience of a family reunion. The occasional high-pitched chuckle, distinctively Sophie’s, rises above the twang of an electric mandolin and accompanying chatter. Moe has a bottle of Diet Coke in hand, the same drink Sophie bought habitually at the gas station where they first met, and he later asked her out—the start of their love story. Standing next to each other, they seem like an odd couple—Sophie, loud and honest, and Moe, always looking to Sophie who stands a few inches taller. But as she puts her hand on his shoulder, their love is anything but odd. “As they say,” she says with a smile, “Insha’Allah.” God willing.